Luo Shu Square(AKA Lo Shu or Magic Square) is unique, Chinese history says that Fu Xi uncovered the trigrams after discovering the formula for the Luo Shu on the back of a turtle as it emerged from the Luo River, The odd and even numbers radiate around the centre (number 5) of the Luo Shu square in an odd even pattern; this gives rise to any single line being either +-+ or — the 4 even numbers are at each corner, and the 4 odd numbers (other than 5) form a cross in the centre of the square. The sums in each of the 3 rows or the 3 columns and in both diagonals are all 15. Number 5 is the centre cell; sometimes referred to as the “Central Palace” the sum of any two other cells which pass directly through 5(Central Palace) is 10. Whichever direction you add the numbers – horizontal, vertical or diagonal – they always add up to 15. Number 15 is considered a powerful number as it corresponds to the number of days in each of the 24 cycles of Chinese solar year and 24 mountains is also significant in Xuan Kong Feng Shui School. 15 is also the number of days in the cycle of the new moon to the full moon. The Feng Shui bagua evolved from the Luo Shu Square, in China South is placed at the top of the maps. Number 9 is the number for the South bagua area (on top) and 1 is the number for the North bagua sector (bottom of the square). Odd numbers are Yang energy, and the Even numbers are Yin energy. Numbers in the Luo Shu Square are considered to have specific properties, or express specific energies. For example, number 9 carries a strong Fire Feng Shui element energy, while number 1 is an expression of the water element. In Feng Shui they are called “stars” and they predictable pattern to their movement. In the flying stars school of Feng Shui (Xuan Kong), the movement of stars is charted each year in order to define the movement of specific energies, both positive and negative. Knowing this pattern, you can create a balanced Feng Shui environment. Each number in the Luo Shu represents a star and each stars movement is tracked using the “Luo Shu Trail”, starting at the central palace and ascending in numerical order i.e. 5 > 6 > 7 > 8 > 9 > 1 > 2 > 3 > 4 once you know this pattern you can float any numbers positive or negative in the luo shu square. Lets expand it a little , here we see the Luo Shu trail overlaying each number. Let’s take an imaginary knife and cut the trail in half and seperate each side, as you can see the right side is the polar opposite of the right. If you wish to create your own flying star charts, it’s important to get so good at the Luo Shu trail it becomes second nature because if the maths is wrong everything else will be too. So Practice, Practice, Practice, Practice, Practice, Practice and Practice. A magical turtle emerged from the water with the curious and decidedly unnatural (for a turtle shell) Lo Shu pattern on its shell: circular dots giving unary (base 1) representations of the integers one through nine are arranged in a 3 X 3 grid. 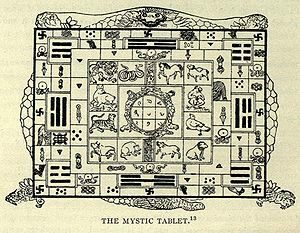 Early records are ambiguous, referring to a “river map”, and date to 650 BCE, but clearly refer to a magic square by 80 CE, and explicitly give one since 570 CE. The odd and even numbers alternate in the periphery of the Lo Shu pattern; the 4 even numbers are at the four corners, and the 5 odd numbers (outnumbering the even numbers by one) form a cross in the center of the square. The sums in each of the 3 rows, in each of the 3 columns, and in both diagonals, are all 15 (the number of days in each of the 24 cycles of the Chinese solar year). Since 5 is in the center cell, the sum of any two other cells that are directly through the 5 from each other is 10 (e.g., opposite corners add up to 10, the number of the Ho Tu (河圖)). The Lo Shu is sometimes connected numerologically with the Ba Gua 八卦 “8 trigrams”, which can be arranged in the 8 outer cells, reminiscent of circular trigram diagrams. Because north is placed at the bottom of maps in China, the 3×3 magic square having number 1 at the bottom and 9 at the top is used in preference to the other rotations/reflections. As seen in the “Later Heaven” arrangement, 1 and 9 correspond with ☵ Kǎn 水 “Water” and ☲ Lí 火 “Fire” respectively. In the “Early Heaven” arrangement, they would correspond with ☷ Kūn 地 “Earth” and ☰ Qián 天 “Heaven” respectively. Like the Ho Tu (河圖), the Lo Shu square, in conjunction with the 8 trigrams, is sometimes used as a mandalic representation important in Feng Shui (風水) geomancy.